Ever since Twitch got gobbled up by cardboard box kingpin Amazon, the two have gone together like a ham and cheese sandwich – or that dreadful PB&J concoction if you’re in the US. Got Amazon Prime? You’ve also got free-game service Twitch Prime – and to celebrate the upcoming day o’ deals Amazon Prime Day, Twitch are giving away a free game everyday for Twitch Prime members. Here’s a list of everything you can get, and when you can grab it.As noted above, you’ll need to have Amazon Prime and have linked it to your Twitch account to take advantage of the offers. You’ll also have to play the games through Twitch’s desktop client rather than Steam, but as long as that doesn’t put you off, there are some pretty sweet deals up for grabs nonetheless. It’s pretty easy to sign up for Amazon Prime if you don’t have it already – just click here if you’re in the UK, or here if you’re in the US. 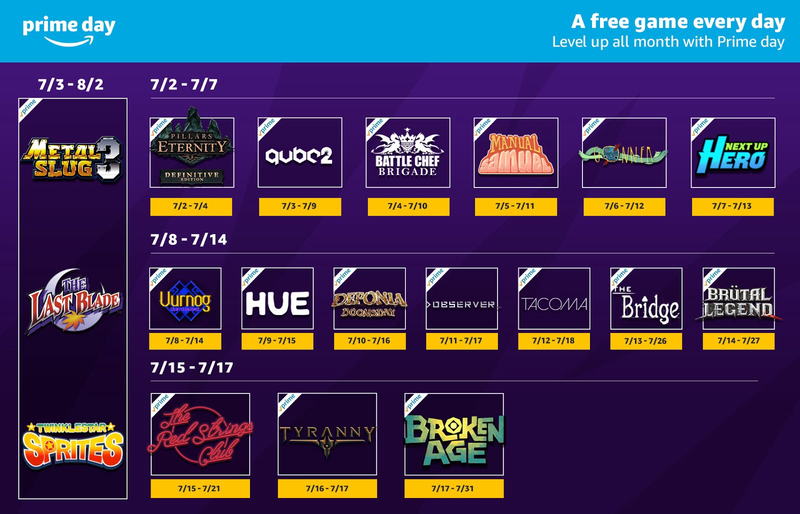 Then, head to Twitch’s Prime page here and you’ll be able to claim your free games when they become available. Remember, this is in addition to all the free games you get every month as part of Twitch Prime anyway, so it’s a pretty tidy deal if you ask me. Just beware that some games are available longer than others – you’ll still get a new one each day up until July 17 (when Amazon Prime day comes to an end), but some of them disappear quicker than others, so make sure you claim it before it’s gone. To the games! Click to expand for more details. If you’ve been eyeing up Pillars of Eternity II but want to take John’s advice and play the original Pillars first, then you’ve really got no excuse. Not only is the definitive edition of the game, netting you the White March DLC expansion, but it’s also completely free. Normally you’d have to shell out around £35 for this on Steam, so that’s a pretty sweet bargain for anyone who missed out on Obsidian’s sprawling RPG the first time round. SNK’s classic gun ‘n’ runner from the Neo Geo era, Metal Slug 3 scratches a very similar itch to Contra. What’s more, the PC version has been updated with online multiplayer, so you can always team up with a friend and play the whole thing in co-op if you’d prefer. This isn’t quite as good a deal as Pillars – Metal Slug 3 will normally set you back just £5.99 – but hey, you can’t win ’em all. Another SNK Neo Geo game ported to PC, this is essentially Street Fighter II meets Tokugawa-era samurai sword-fights. By all accounts the PC port isn’t brilliant, but if you like the idea of a slicing and dicing 2D fighting game instead of your usual punching and kicking, then you might as well pick it up. Are you sensing a theme here? Yep, its another SNK Neo Geo port, this time in the form of a competitive 2D top-down scrolling shooter. A shump, if you will. This one looks like it might burn your retinas with its bright anime look and sparkling bullet effects, but if shoot’em ups are your bag, you may have some fun here. Are they gone yet? Are the SNK ports over? Phew. Now we’re back into more familiar territory. QUBE 2 is a rather lovely-looking first-person puzzle game that sees you use funky alien gloves to manipulate blocks and glowing bits of wall to escape a Portal-esque lab environment. It’s a good’un. A cooking game that’s also a match-three puzzler that’s also a 2D brawler where you go out and slice up your own ingredients? Sounds like a winning recipe to me. Indeed, Tom Sykes rather liked it when it came out late last year, so if you’ve yet to take a bite of this delectable puzzler, now’s a good time to do so. Have you ever played QWOP? Then you’ll have some idea of what Manual Samuel’s like. After a terrible accident, poor Samuel needs a bit of assistance keeping himself alive while he goes about his daily business. Things like breathing, blinking, walking… you’ve got to do it all for him otherwise he’ll suffocate, his eyeballs will dry up, or he’ll just collapse into a useless pile on the floor. A little smug in places, but a very good laugh. Gonner is a real beaut. Adam (rest in peace) loved it when it first came out, calling it 2016’s Downwell. It’s an action-platformer at its core, but your abilities depend on what kind of monster head you’ve got attached to your body. You can lose your head and acquire new ones, but get hit by one of its many enemies when you’re headless and it’s game over. A Gauntlet-style dungeon crawler, now with added Valve hero characters, Next Up Hero is probably a game that’s best played with a mate. It’s got rather mixed reviews over on Steam, so you may want to give this one a miss if you’re only here for the cream of the crop, but hey, there’s probably something to be said for watching a cartoon Gordon Freeman team up with a Portal turret gun to fight an ogre. A puzzle platformer from Kyntt creator Nifflas and his mates, Uurnog Uurnlimited (try saying that three times fast) is all about nicking the local wildlife and using them as power-ups to get through a strange, alien landscape while listening to some out-there electronic music. Originally commissioned as a Humble Original for Humble’s subscription service, Uurnlimited adds new features like co-op play, a level editor and more boss fights. A lovely puzzle platformer with a melancholy soundtrack, Hue is all about manipulating the colours in your environment to find a way forward and save your mum. Whether it’s blending deadly lasers into the background or making impassable walls disappear while you escape from giant boulders, Hue will have given your brain a real workout by the time you reach the end of it. Some may find it a bit twee, but I played this over the weekend and really loved it. John is not a fan of point and click series Deponia, calling this fourth, standalone entry “a wretched turd of a game“. As such, you should probably steer clear of this one, and just wait until the altogether better >Observer_ arrives tomorrow. Ahh, that’s better. The rather brilliant >Observer_ is a first-person thriller that’s a “masterclass in cyberpunk horror” according to Adam (bless his departed soul). You also play a character voiced by Rutger Hauer, the baddie from Blade Runner. Need I say more? Tacoma is the next game from Gone Home developer Fullbright, and Pip (we miss you) called it a “masterclass in environmental and gradual storytelling“. Good to know there are so many masterclasses on this list, eh? Tasked with finding out what happened to the crew of an abandoned space station, Tacoma is an ingenious story told through watching AR reconstructions of crew conversations and snooping through their email terminals and personal belongings. It won’t be for everyone, but it’s also free. A game that really wants to be its own Escher painting, The Bridge is one of the best PC puzzle games of ALL TIME. Fact. In it, you must twist and turn the environment to create new pathways and walk your middle-aged professor man through a world of ever-increasing weirdness. It’s great. Brütal Legend sees the likes of Jack Black and a cast of rock stars lend their raucous voices to this mad, slightly wonky heavy metal action-RTS hybrid from the brain of Tim Schafer. Alec had mixed feelings about this one when it first came out, but still ended up liking it anyway, so maybe you will too. Matt likes The Red Strings Club very much, as do I. It’s a narrative adventure whose heady cocktail of transhumanism, drink-mixing, cyberpunk implants and generally nefarious mind control goes down a real treat over the course of its three-four hour run-time – and there’s no drink as sweet as one that’s on the house. Another giant traditional RPG to sink your teeth into, but one that’s not nearly as good as Pillars of Eternity according to John, who dubbed it a “Really Annoying RPG” due to its tedious combat. However, he also said that underneath all the fighting there’s still an interesting nugget of game to be found if you’re willing to look for it. A game of two halves, Broken Age has a really good opening and a not-so-great ending. A return to the point and click adventures of yore, this is another madcap tale from the mind of Tim Schafer and those folks at Double Fine. It might not be particularly challenging, but it is very pretty. The Framed games have only just come to PC, but this Collection, which includes the original Framed and Framed 2, is a noir comic-book-inspired delight. Sort of a bit like Gorogoa, Framed sees you move comic panels of a story around to change its outcome and guide your monochrome hero to safety. So often in games we’re the ones making the mess, spilling a trail of blood and guts in our wake. In Serial Cleaner, you’re the poor sod who’s now got to clean it all up, moping up the stains left behind by the criminal underworld. Alec said it was a “really good game inside the shell of a bad one” when it came out last year, but still found it strangely addictive. Either way, at least you don’t have to feel guilty about it cleaning out your wallet if you don’t like it. Have You Played... Battle Chef Brigade?